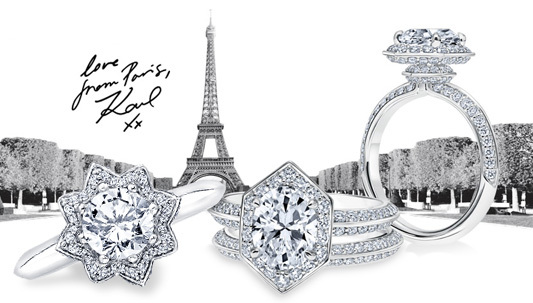 Luxurious engagement rings from Karl Lagerfeld are designed to last a lifetime! Three collections are strong in style, elegant and emotional. Modern, edgy aesthetics include the legendary designer’s iconic pointed stud motif, geometric patterns, and the inspiring curves and arches of Parisian architecture. Design details make all the difference in the sleek silhouettes of the line. Select from precious metals ranging in tone from cool 18K white gold or platinum to warm and sunny 18K yellow gold. Karl Lagerfeld’s engagement settings deliver an unprecedented level of cachet, whatever fashion you favor. Choose from mountings that offer a new twist on a long-standing classic, something feminine and floral, or have a charming vintage vibe; all are distinctive, eye-catching and glamorous, and will make you feel special.